The gray bat weighs 7 - 9 g (0.2 - 0.3 oz). Its limestone roosting caves and foraging areas are near water bodies such as streams, ponds and reservoirs. Its diet consists predominantly of insects. All species of the genus Myotis, including the gray bat, roost by day and forage at night. The feeding flights usually alternate with periods of rest, during which the bats hang to digest their catch. Colonies of the gray bat travel up to 6.6 km (4.1 mi) from roost to foraging areas. During the summer a colony occupies a definite home range and may move among 6 or more roosting caves. Large-scale movement to hibernation sites begins in September and covers 17 - 437 km (11 - 271 mi) (Nowak & Paradiso 1983) . Gray bats are highly gregarious. They hibernate in large colonies in caves during the winter. In the summer, females gather in smaller colonies at other caves to give birth, while the males collect nearby After late July, the males join the maternity colonies. 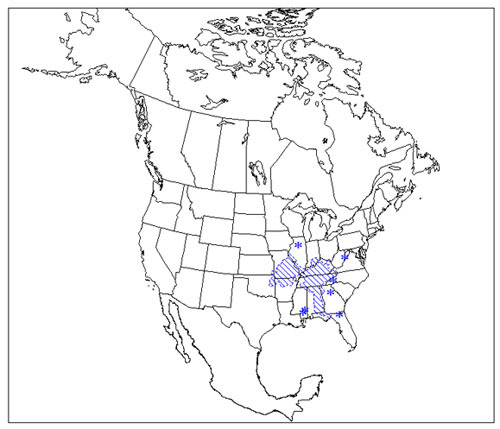 The gray bat occurs in the central USA. It is thought to have declined mainly due to destruction by vandals and disturbance by spelunkers and tourists. *** The gray bat occupies the coldest reported summer roosts in North America (down to 13 deg C (55 deg F)). 2004: Occurs in the USA (IUCN 2004). The gray bat is found in the USA from eastern Kansas and Oklahoma to western Virginia south to northwestern Florida. As of 1987, approximately 95% of the population was estimated to hibernate in nine roosts, with one containing more than 50% of the population (Burton & Pearson 1987) . As of 1987 the gray bat was estimated to have declined by up to 76% from its original population (Burton & Pearson 1987) . The decline has been attributed mainly to destruction by vandals and disturbance by spelunkers and tourists. Its distribution has always been patchy, but it is becoming increasingly fragmented. The gray bat roosts in limestone caves. It roosts near and forages over water bodies such as streams, ponds and reservoirs. Young are born in the summer. Births are highly synchronous. A young gray bat makes its first flight anywhere from 24 - 33 days after birth, depending on the size and temperature of its birth colony. The gray bat's diet consists predominantly of insects. Gray bats are highly gregarious, concentrating in large numbers in a small number of caves. They hibernate in large colonies in caves during the winter. In the summer, females gather in smaller colonies at other caves to give birth, while the males collect nearby. After late July, the males join the maternity colonies.